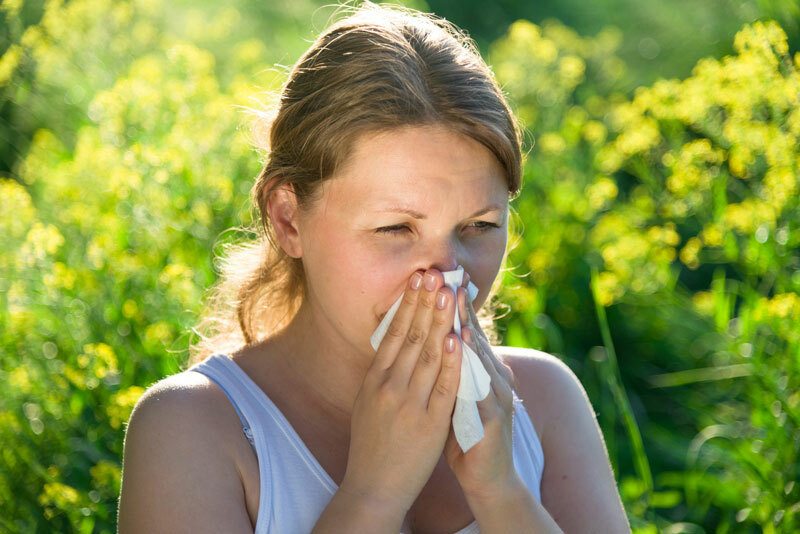 Tips to relieve seasonal allergy symptoms. After a long winter, plants are waking up and putting their energy into reproducing. While this is great for plants, it’s not so good for humans suffering from allergies. Spring is a time when many people experience a flare in their allergy symptoms. Luckily, there are a few tricks to keep allergy symptoms at bay. It’s tempting to let in some of the fresh spring air, but it often only makes symptoms worse. Running the air conditioner is a more allergy-friendly option when it’s warm outside, at least from 5 a.m. to 10 a.m. when the pollens are maximum in number. When you’re out and about during the day, your clothing and hair get covered in grass and pollen spores. If you shower in the morning, that means you’re bringing the day’s allergens into your home and bed. Shower at night to get rid of all of those pesky irritants before going to bed. One symptom of allergies is congestion. You can help to clear out your nasal passage by adding more spicy foods to your diet. Cayenne pepper, horse radish, or hot sauce are easy to add to any meal and add a world of flavor! Many people do report that the oil of oregano helps them feel better when they’re dealing with the typical symptoms of allergies. Taking this supplement will reduce the amounts of histamines found in the blood (this is the chemical that causes swelling and allergic reaction). Eating a cleaner, healthier, diet will help to improve your immune system and fight off allergies. Avoid mucus and congestion-causing foods such as dairy products, milk, and processed wheat. Aim to fill up on fruits, veggies, nuts, legumes, beans, and seeds. Eating foods high in anti-oxidants will help too, such as grapes, tomatoes, oranges, nuts, and apples. We hope that these tips help to alleviate some allergy symptoms! For all of your insurance needs, contact us at Lloyd S. Berkett Insurance Agency. Located in Los Angeles, our dedicated team is ready to get you the coverage you need today.